Many people around the world who embrace "Christianity" have never heard the true Gospel. They believe Christianity is nothing but a different set of rules, substituting Christian "dos and don'ts" for those of other religions. They continue to believe they must earn their way to God and then do their best to deserve the benefits of salvation. That's not the true Gospel. Accepting Jesus as your Saviour with the belief that you are now going to abide by a certain set of rules, or exchange one set for another, is not the good news. Why? Because it still depends upon your performance. And I can guarantee you that the devil will make sure you know that your performance is not quite good enough. He is the accuser of the brethren (Rev. 12:10). The truth that makes the Gospel the "nearly-too-good-to-be-true news" is that we are accepted by God through what Jesus did for us. The revelation of God's grace will deliver you from a performance mentality to a total trust and reliance upon the Lord. Salvation is all about God's faithfulness, not ours! This is foundational for maintaining a close relationship with God and receiving all the benefits of your salvation. "For I am not ashamed of the gospel of Christ: for it is the power of God unto salvation to every one that believeth; to the Jew first, and also to the Greek. For therein is the righteousness of God revealed from faith to faith: as it is written, The just shall live by faith." The book of Romans communicates that the Gospel is the power of God. It's what produces the life of God in people. However, the word Gospel has become a religious term that has lost a lot of its meaning today. Many people associate "Gospel" with anything that has to do with religion, specifically the Christian religion. But "Gospel" literally means "good tidings," or "good news." The Greek word euaggelion, which was translated "gospel" in seventy-four New Testament verses, was so rare in writings outside of the New Testament that it's only found twice in extra-biblical manuscripts. The reason for this is because this word not only meant "good news," but was actually describing "nearly-too-good-to-be-true news." Much of "Christian culture" today associates the Gospel with these statements: "You're a sinner. If you don't repent, you're going to hell." Now, these are true statements. There is a heaven and a hell, a God and a devil, and you will go to hell if you don't repent and receive salvation, but even though all of that is truth, it's not "good news." It's not "the Gospel." As a matter of fact, it's the complete opposite of what Paul was teaching. Roman 2:4 says it's the goodness of God that leads us to repentance, not judgment and condemnation. That is what Paul was talking about, and that is "good news." The Gospel is directly related to the grace of God. That's the only way this forgiveness of our sins can be obtained. It isn't through our holiness or good works. God doesn't take the "good" people and save them; He justifies (extends salvation toward) the ungodly (Rom. 4:5). This causes many problems for religious people. They say, "Wait a minute! I believe you must do this and that to be holy." Religion - false religion, man's concepts - teaches that right standing with God and His blessings come as a result of our own goodness and works. Religious teachers say, "You must come to our church. You must pay your tithes, read your Bible, and pray more, to mention a few. Then, if you do all these things just right, God will accept you." That's anti-Gospel! It's against the "good news" of God's grace because it's putting the burden of salvation on your back - and you can't bear it. Nobody can save themselves. That's basically the false "Gospel" that religion preaches today. They may talk about the one true God and use terminology like "God the Father." They may even mention that Jesus is the Saviour of the world who died for our sins. But at its core, it's another "Gospel" - which is no Gospel at all (Gal. 1:7). "But none of these things move me, neither count I my life dear unto myself, so that I might finish my course with joy, and the ministry, which I have received of the Lord Jesus, to testify the gospel of the grace of God" (Acts 20:24). Another way Paul could have said this is, "I am testifying of the Gospel - which is the good news of the grace of God." The words "Gospel" and "grace" are terms that can be used interchangeably. The good news - or Gospel - is the grace of God. Even the word "salvation" is misunderstood. Evangelical Christianity says that salvation is a one-time occurrence, an experience when your sins are forgiven. That's true; there is a moment when you pass from death to life, but that is not all that happens. It's an incomplete definition. Salvation isn't limited to the initial born-again experience. Salvation is everything Jesus purchased for us through the atonement. Sozo, the Greek word from which "saved" was translated, means more than forgiveness of sin; it also means healing, deliverance, and prosperity. It's a word that summarizes everything that Jesus provided for us through His death, burial, and resurrection. "Is any sick among you? let him call for the elders of the church; and let them pray over him, anointing him with oil in the name of the Lord: And the prayer of faith shall save [sozo] the sick, and the Lord shall raise him up; and if he have committed sins, they shall be forgiven him" (brackets mine). Salvation is a package deal, and it's all accomplished by the grace of God, not our works. However, Satan is always trying to deceive us. He is the one who wants us to believe we must earn things from God. He is the one causing us to doubt the Lord's willingness to use His ability on our behalf, and unfortunately, the church is often reinforcing that belief. I've had many believers come up to me in the prayer lines asking, "Why am I not healed? I've fasted, prayed, and studied the Word. I pay my tithes and go to church. I'm doing the best I can. What does God demand?" When I hear that, they have just given me the answer to their question. They aren't pointing to what Jesus did; they are pointing to what they have done, and that always leads to failure. Most people believe that God moves in their lives proportional to their performance. That was the error Paul was dealing with in the book of Romans. When Paul came along and said, "I'm not ashamed of the Gospel!" he was saying, "I am not ashamed to tell people about the goodness, grace, and mercy of God. The Lord loves us in spite of who we are and what we've done." Now that's "good news!" The religious folks of Paul's day thought this was terrible. They believed what he was preaching was heresy. People needed to recognize and relate to God based on how sorry they were. God wasn't happy with them or the way they were acting. They were just worms in His sight. Sound familiar? On the surface it looks like a humble position. In reality, it's actually making a person's relationship with God dependent on self. "Look what I have done for the Lord, how holy I've been, and how much I've denied myself." This is actually a very self-centered, self-dependent way of approaching God that never produces any fruit in your life. "For the wrath of God is revealed [not going to be, but already is revealed] from heaven against all ungodliness and unrighteousness of men, who hold the truth in unrighteousness; Because that which may be known of God is manifest in them; for God hath [past tense]shewed it unto them" (brackets mine). God's wrath has already been revealed intuitively inside of every person. Each individual has within them the knowledge of God's wrath against all ungodliness and unrighteousness of men. So when someone wonders, If I just tell people about the goodness of God, what will make them understand that they are sinners in need of salvation? Paul's answer was that they already knew. In their hearts, people already know that they aren't good, but sinners in need of salvation.The point is that you don't have to bombard people with the fact that they are sinners; deep in their hearts they already know. You may need to spend some time on that issue in order to make your point and strike that chord in their hearts, but not by condemning them and restricting them to religious do's and don'ts. Paul was saying, "That's not the true approach." It's the Gospel - the nearly-too-good-to-be-true news that God has provided. It's salvation for us by grace that empowers men to receive the forgiveness of their sins, the healing of their bodies, the deliverance from Satan's oppression, and more. We don't need to convince people they are sinners; we need to show them the way out. That's the Gospel! Do you need to be healed? The power for healing is in the Gospel. Do you need to be prospered financially? The power for financial prosperity is in the Gospel. Do you need to be delivered from the power of demonic influence, from depression, from yourself, or from something else? The power for deliverance is in the Gospel! The Gospel is the power of God. It's "nearly too good to be true." 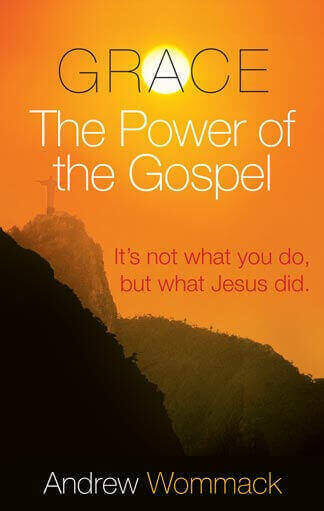 I've just released a new book entitled Grace: The Power of the Gospel. I think it could radically change people's perception of how God relates to us. This is a synopsis of Paul's masterpiece on the subject of the Gospel of grace, the book of Romans. It has changed my life, and it can change yours too. For the first time, I am also releasing a companion Study Guide. It's a great tool for Sunday school class, Bible studies, or one-on-one discipleship. Included inside the front cover is a CD-ROM that will allow you to reproduce as many copies as you need to facilitate teaching others. I encourage you to get several copies of this book along with your study guide. The book is available for a gift of £7/Ã¢Â‚Â¬12. The study guide, including the CD-ROM, is available for a gift of £17.50/Ã¢Â‚Â¬28 or more. I also have this teaching in cassette, CD, and DVD formats (DVD recorded from television). To order any of these materials, select one of the above links or call our Helpline on +44 (0) 1922 473300, or write to us, the address is on the contact us page. Thanks for your partnership with Jamie and me in the true Gospel. It's releasing the power of God into hearts all over the world, and you have a big part in all of that.